In Episode 20, Marc examines the role of precedent in WTO litigation, explains the renewed interest in DSU XXV, and demonstrates why the U.S. is ill-served by undermining the veracity of precedent at the WTO. 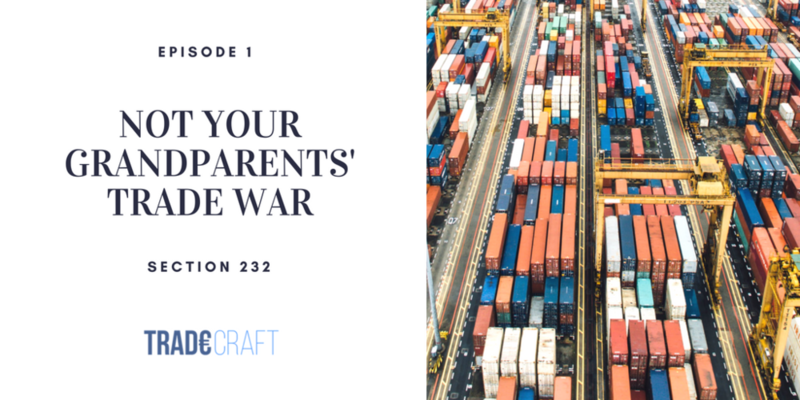 Welcome to TRADECRAFT, a new podcast exploring the craft of trade policy. In Episode 1, Marc explains how the WTO is proving its worth amid the steel and aluminum tariffs fallout, explores why GATT Article 21 should give pause to the Trump Administration (as well as to every other WTO member), and reveals how the EU, with its recent retaliatory action, might have just ceded its legal high ground to the United States. In Episode 2 - Pt. I, Marc explores the issues that inspired the Section 301 tariffs against China, reveals how China is taking its cues from a 1998 EU case against the U.S., and explains why the issue of “separability” could confound the Trump Administration’s legal justification and affect the future of Section 301 action. In Episode 2 - Pt. II, Marc examines how the Trump Administration’s strained relations with traditional trading partners might affect the developing trade war with China, games out what non-tariff barriers China could turn to as it retaliates against the U.S., and highlights an issue that should keep all free-traders up at night — Sovereign Patent Pools. In Episode 3, Marc highlights the features of modern preferential trade agreements, explains why countries are in an arms race of sorts to negotiate them, and works out how the United States' trade agreement strategy is evolving--and what that could mean for global trade. In Episode 5, Marc analyzes the Administration’s current trade policy agenda in light of the coming midterm elections, and offers up a vision for a new, post-election trade agenda that would allow President Trump to go on the offense while forging closer ties to China. In Episode 8, Marc makes sense of the WTO reform proposals in play, delving into the issues of Precedent, S&D treatment, and Appellate Body overreach. In Episode 11, Marc explains the different types of services, highlights the work of Kindred.ai, and explores how AI-enabled robotics could transform our understanding of Mode 4 services. In Episode 6, Marc works through the key sticking points keeping Canada out of a NAFTA 2.0, muses on the future of Trade Promotion Authority, and breaks down the Republican/Democratic divide over the so-called "United States - Mexico Trade Agreement" now on a 90-day clock. In Episode 9, Marc explores the central problem that ISDS is trying to solve, dispels damaging myths surrounding the system, and explains why developing and rich countries, alike, depend on ISDS. In Episode 12, Marc makes the case for firms to build out their trade capacity, demonstrates why this trade unit should be central to a company's non-market strategy, and serves up compelling case studies of companies that have used aggressive trade strategies to dramatically increase their market share. 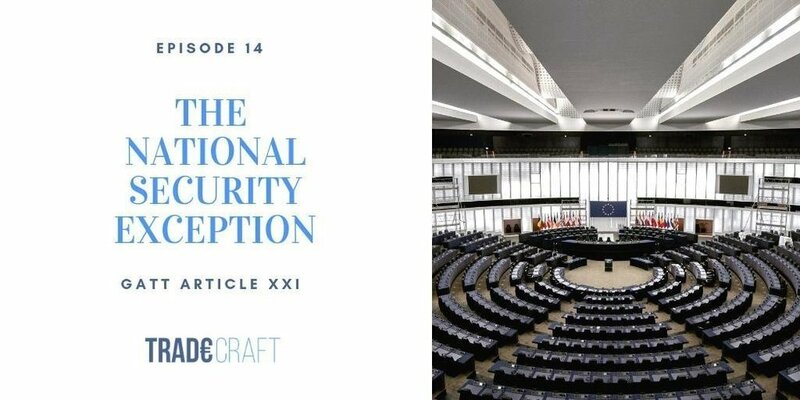 In Episode 14, Marc examines the "National Security Exception" in light of DS512 (Ukraine-Russia) and a handful of other cases, diving into GATT Article XXI to tease out the framers' intentions and make sense of the "self-judging" debate that will be central to any panel ruling. In Episode 17, Marc explores biologic drugs, explains why data exclusivity is so important to their production, and challenges the House Democrats' recent push to reopen USMCA over the 10-year data protection term for biologics. In Episode 15, Marc digs into the “U.S. Reciprocal Trade Act," draws out the non-tariff barrier element the media has largely missed, and demonstrates why a bill that is likely “dead on arrival” poses such a serious threat to trade promotion authority and the larger political debate over trade in the U.S. In Episode 18, Marc examines the Generalized System of Preferences’ (GSP) original aims and origins, shows how the WTO exacerbates the program’s most detrimental elements and harms developing countries in the long-term, and defends USTR’s decision to suspend India’s GSP benefits. In Episode 4, Marc breaks down the WTO’S dispute settlement system, weighs the political and commercial risks/benefits of pursuing litigation at the WTO, and explains why the yet-to-be-filed endocrine disrupter case could become the most important case the WTO has ever heard. In Episode 7, Marc breaks down Technical Barriers to Trade (TBT's), identifies the philosophical differences that stalled past T-TIP negotiations, and demonstrates why an "early harvest" on TBT would be a loss for both sides. In Episode 10, Marc explores Trump's impact on the DNC and GOP's traditional trade positions, examines how effectively Democrats are occupying the free-trade lane, and games out what impact this will have on the midterms and party identity into 2020. In Episode 13, Marc looks at the challenges of global trade through whiskey (tariffs, labeling regimes, and asymmetric excise taxes), muses on the industry's future legal fights (cask strength and small batch), and serves up how trade will affect the "water of life" in the New Year. 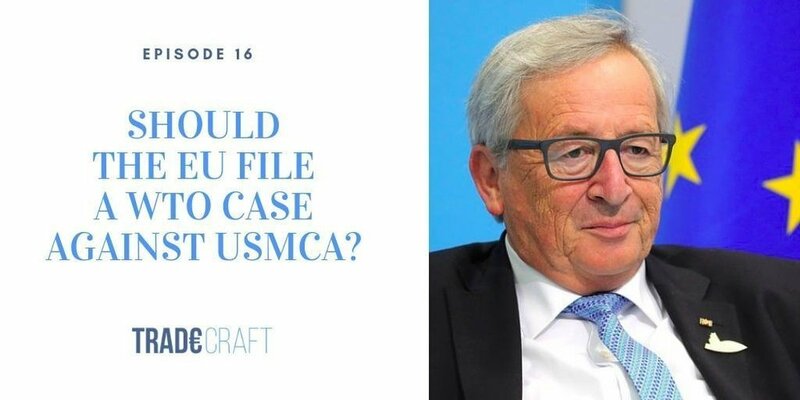 In Episode 16, Marc sorts through the mounting international criticism of USMCA, contemplates how the EU might challenge USMCA at the WTO, and floats a forward-looking trade deal dubbed the "Atlantic Union" that would cover the EU and all NAFTA parties. In Episode 19, Marc revisits the epic Boeing - Airbus dispute, reviewing the aircraft/non-aircraft cases that have informed the debate and calling on the world's leading aircraft companies to reach a new agreement modeled on the EU – US Agreement on Large Civil Aircraft 1992.